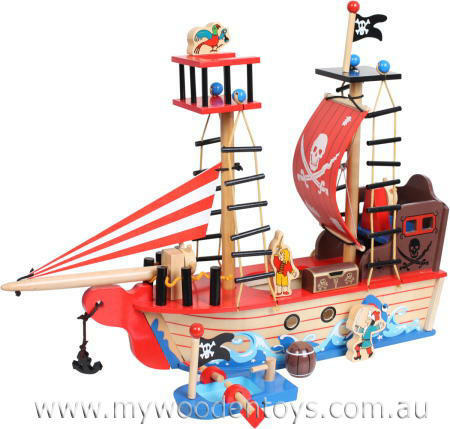 Pirate Ship Wooden Toy is a beautifully made ship all ready for an adventure on the high seas. This ship comes with a treasure chest, barrel of rum, two figures, a parrot and a little rowing boat with oars. The sails are made of curved wood and the rigging is of quality cord. A lovely design on the boats side shows water and a shark about to attack. The ship has an open deck giving you access to the ships hull where things can be stored or pirates held prisoner. Portholes are cut into the ships side so you can spy what is inside. A brilliant toy at a very reasonable price. Material: Wood child-safe paint. Nylon cord. Elastic. We like this because: "Wonderful role-play toy, sturdy and well made."